Kinzler Construction Services recently insulated this duplex in HiLo Denver. The contractor encountered several challenges which our expert team helped solve quickly in order to keep the inspectors happy and the project on schedule. Closed cell spray foam was used on the ceiling in 2’x8′ cavities that needed to achieve an R49. 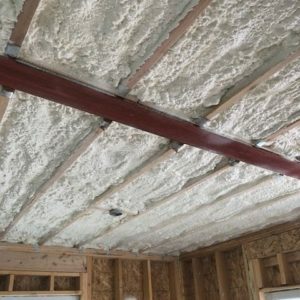 Kinzler sprayed foam insulation in a vaulted ceiling that ran the length of the house. Because this is a duplex, the builder was particularly concerned about sound transfer. Our team suggested noise-reducing options and mineral wool batt insulation was selected to place in common walls. Blown-In-Blanket (BIBS) was used on others walls where sound transmission was not a worry. 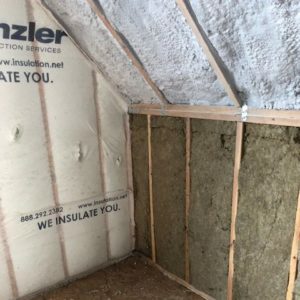 Kinzler Construction Services has more than three decades of insulation install experience. We have a proven process created to ensure your project passes inspection the first time, saving you time and keeping the entire project on budget. Contact us today to discuss partnering on your next project!